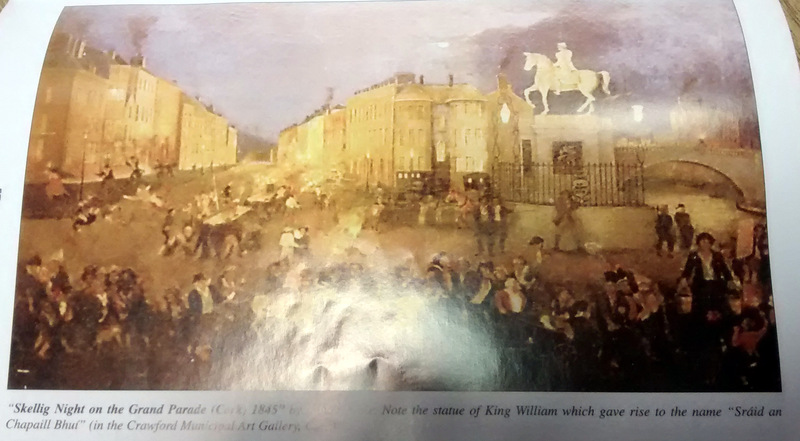 Skellig Lists, Bandon 1843, Dunmanway 1846, Ballydehob 1912, Celebration of Skellig Night, South Mall, Cork 1845. Skellig Lists, Bandon 1843, Ballydehob 1912, Celebration of Skellig Night, South Mall, Cork 1845. Yet indeed there may have been many more. While dresses flutter and tresses wave. Whom do I see at the head of them all? Two dandy young pairs trips merrily on. How could cupid get on if lovers be late? Lost to the world in “Loves Young Dream”. So lively their gait and so loving their airs. Let us hope you and I will be there then to see! For isn’t she linked with Mr Paul Skuce? Who are those wandering on dangerous ledge? And Fanny Attridge bright and gay is the one he has brought here. His bargain, and twixt you and me, he’ll only get his due. This maiden who leans toward single bliss? Does Fanny need her watchful care? Or does she love the sweet night air? With her neat little shop are well worth a man. To prevent him from marrying and we all wish him joy. Tis soon they are thinking of building a nest! They’ll have a fine chance when you take the lead. And who is pelting far behind? May Jennings and Bob Salter I declare! Indeed they are a comical pair! Tis grand, a breezy, midnight race! And Miss Emily Swanton the very one. May your future felicity nothing alloy! They shouldn’t be classed with those names of renown. Our first Bally list was so sweet and so short. At the time of this list Shrove Tuesday was a night of great celebration, fun and feasting (a bit like Mardi Gras in Rio) as during Lent there was no dancing, parties etc. and most importantly no marriages in either the Protestant or R.C. churches. However the monks on Skellig for a very long time refused to abide by the agreed date for Easter and their Easter, and therefore Lent, was eleven days later each year. This gave rise to Skellig lists as a party piece to make fun of unmarried couples by suggesting that they should go to Skellig forthwith. 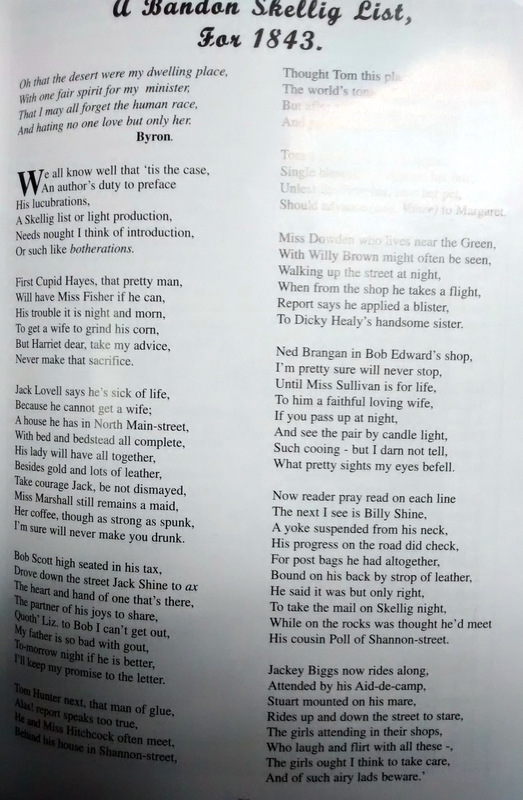 This list was made up by Jack Roycroft, (son of Martha Skuse), and would have been performed at the big annual parish party on Shrove Tuesday evening. As it was for such a polite gathering it is very mild in its suggestions. The lists around the town and pubs would have been very different and more than a little bawdy in the suggestions, especially when referring to some of the older spinsters of the area as you can imagine. 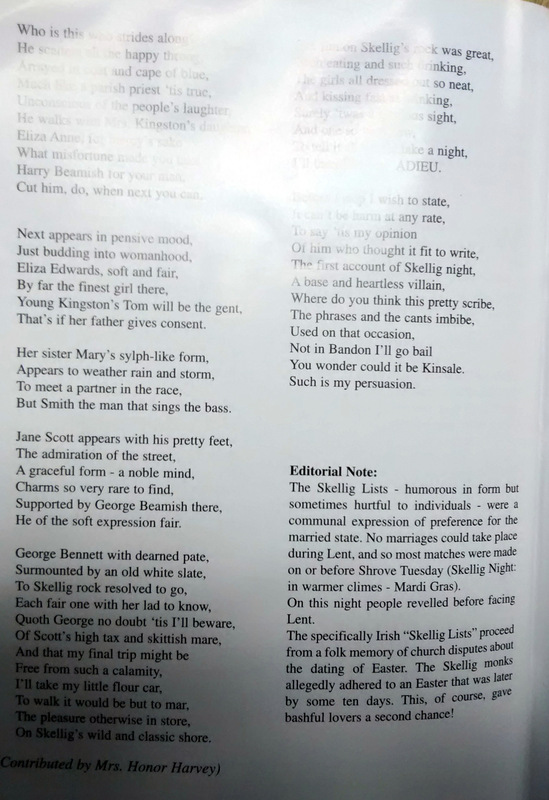 The archive of the Dept of Irish Folklore in University College Dublin has a whole collection of Skellig Lists. The Skellig itself is well worth a visit, you can get a boat trip each day in summer months from Port Magee near Valentia. There are something over 600 steps to climb up to the monastery and the views etc are fantastic. also the sea birds, tens of thousands of Gannets and you can take a rest half way up and sit down five or six feet from a Puffin, they nest all over the place. Cork Examiner 28/1/1846 – DUNMANWAY AMATEUR BAND – TO THE EDITOR OF THE CORK EXAMINER – SIR, Perhaps you will allow me through your Journal to contradict some statements in ‘Non Repealer’s’ letter, published in the Examiner of this day, relative to the Amateur Band of this town. The writer of that letter have also grossly misrepresented the entire proceedings of the ‘Soiree’ therein alluded to. It would appear to a reader of that letter, that the Members of the Band went to the Soiree on free tickets. The Leader was also presented to the public as soliciting subscriptions from the persons present, to purchase clothing for his musical colleagues. In reply to the first of these misrepresentations, I need only say, that though having been very politely offered tickets gratis by the Committee, – they unanimously refused to accept them unless on the same terms as the other persons who attended. The second statement is equally groundless; and in this I ..eality would need not reply, as it is too well known that unless for the purchase of instruments no other subscription is applied for, – no – not even for music or instruction, as the Leader very kindly gives both gratis, beside that he with the other members of the band, have subscribed as liberally for the purchase of the instruments as many of the other subscribers – as to all the ‘hems’ and ‘haws’ attributed to him, I can tell your readers, that he can express himself in public or in private, infinitely better than his traducers. We subjected ourselves to their shower of calumny, by having found it our duty to discard from our musical society, two members for non-compliance with its rules, and for other misconducts. The after dealing of these ex-members gave us no cause to repent having expelled them. They refused to surrender the instruments for the use of the band although fully aware they were purchased by subscription for that purpose. But Sir, these worthies could not of themselves produce such an epistle as that alluded to – they applied to a third person, (one who in this town is rather celebrated for his ‘Skellig List’ genius), who was the only one of the Trio who attended at the Soiree – each supplied his part. One provided the scandal, another made himself useful as an amanuensis – the third person (above noticed) supplied the burlesque speeches, which were equalled by the appropriate airs selected by him for the toasts – the names of which he learned from his namesake – an itinerant catgut scraper, from whom he learned to scratch a few tunes on a violin, to the great annoyance of the neighbourhood in which he resides. Hello, I am conducting reserach on the Skellig Lists and would appreciate any more information you might have with regard to the Ballydehon List above. Was the list ahdnwritten or printed in it’s original form? Many Thanks.